I’d asked the 50-year-old, award-winning, London-based Mexican photographer what he thinks is going to happen to the medium after a week in which it has come more unflatteringly into focus than ever before. 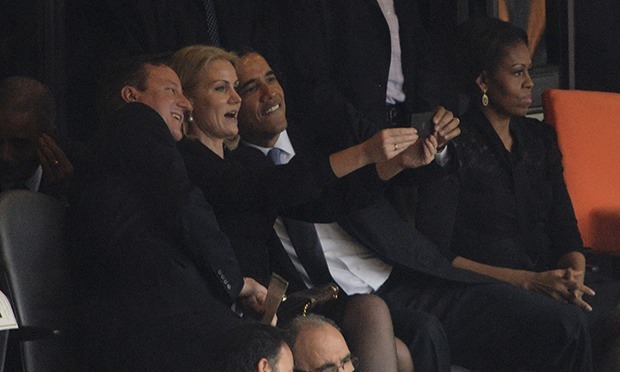 This was the week in which the most reproduced photograph was a photograph of someone (Helle Thorning-Schmidt) taking a photograph (a selfie of the Danish prime minister with two men becoming known as Helle’s Angels, David Cameron and Barack Obama) at Nelson Mandela’s memorial service. It was an image that seemed to typify the narcissistic nature of smartphone photography. But here’s the twist. That photograph of a trio of politicians was captured by Agence France Presse photographer Roberto Schmidt using a digital SLR camera and a huge 600mm lens, and press photographers hardly ever use iPhones. But should they? Today the chief victims of the cameraphone are makers of point-and-shoot cameras. Only two years ago Annie Leibovitz helped put the nails in the coffin of such middle-market cameras by saying that the iPhone was the “snapshot camera of today”. But tomorrow? Maybe cameraphone functionality will become so superb that all you losers who spent four- and five-figure sums on digital SLRs will be overcome with buyers’ remorse and press snappers will be shooting with the same cameras as the rest of us. We’re used to the complaint that we’re taking pictures rather than living in the moment, and that makes us experientially poorer. But Henkel’s study seems to go further, suggesting we don’t even remember the stuff we take pictures of, making the snap-happy nature of modern photography doubly mindless. But doesn’t that mean that some photographers are becoming obsolete, rather than that photography itself is dying? Isn’t what we’re witnessing a revolution in photography, thanks to digital technology, that makes it more democratic? “In one sense yes. I used to be sent on assignment to Iraq, Afghanistan and to photograph the Intifada – partly because there weren’t any local photographers. Now thanks to digital technology, there are locals taking images at least as good as I can. Progress often has casualties, I suggest. “I don’t oppose progress in photography,” he replies. “I’m pleased there aren’t darkrooms and suspicious toxic chemicals you guiltily throw down the sink. I’m pleased there are no longer photography companies who got silver out of Congo by bribing Mobuto for their film, as used to happen. But what about the “crap” iPhone lens? “Who cares? The image isn’t sharp? Big deal! One of my favorite photographers is Robert Capa, whose pictures are a bit blurry sometimes – I love them because he’s captured a moment. But it’s hard for professional photographers not to feel threatened. “Staff photographers are an increasingly scarce commodity, thanks to aggressive cost-cutting by newspapers and magazines, and amateur photographers are exploiting technological advances to produce stunning images, often using no more than their mobile phones,” saysMagda Rakita, a 37-year-old student at London’s University of the Arts and a professional photographer.